DALLAS - Feb. 12, 2014 - PRLog -- Fenton Honda of Longview offers a large selection of Honda Accords, Civics, CR-V’s Pilots, and Odysseys, as well as a variety of quality pre-owned cars, trucks and SUV’s. The East Texas dealerships serve Longview, Marshall, Gilmer, Jefferson, Gladewater, Kilgore, and surrounding East Texas cities taking pride in the vehicles they sell and striving to succeed in providing an excellent customer experience. As the leading auto dealership in the community, they are dedicated to providing all customers with a great experience treating them like family. Recently, Fenton Honda of Longview has partnered with DeliveryMaxx, a leader in digital media services to provide each customer an opportunity to share their great experience with the world and giving the customer a true taste of Victory. “Utilizing DeliveryMaxx, we are able to reach the surrounding communities sharing Fenton Honda of Longview’s great story” states Paul Manziel, General Manager of Fenton Honda of Longview. ““Our business at Fenton Honda of Longview is not just selling cars, but helping put people into the right vehicle that is perfect for their family” says Manziel. “Fenton Honda of Longview is an outstanding dealership for anyone who is looking to purchase a vehicle. Their experienced staff makes the vehicle purchasing experience very easy, and their customer service is second to none” adds James Schaefer, Chief Operating Officer of DeliveryMaxx. 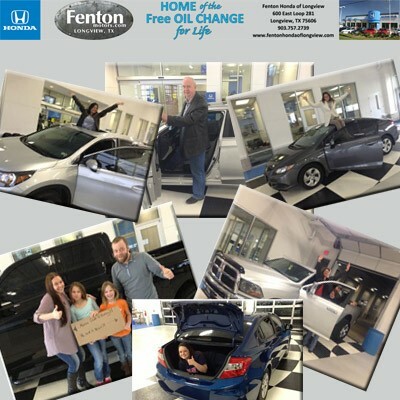 Fenton Honda of Longview is part of Fenton Motors a family of dealerships since 1950. The dealership is located at 600 East Loop 281 in Longview, Texas. For information on award winning vehicles visit the website at www.fentonhondaoflongview.com or contact the dealership by calling 903.757.2739.